Early 19th century settlers of the Sacramento-San Joaquin Delta would have a hard time recognizing the place today. Artificial levees for flood control, debris from hydraulic mining, deepwater shipping channels and massive water exports have fundamentally altered the region's landscapes, ecosystems and functions. Working with the San Francisco Estuary Institute and Research Management Associates of Fairfield, Center researchers developed a model of the early 1800s Delta to characterize the hydrodynamics under natural conditions. Primary inputs to the bathymetric-topographic digital elevation model include two-dimensional Delta channels and land cover data from previous historical ecology mapping (Whipple et al. 2012); elevation data from historical US Coast Survey hydrographs and early river surveys. We developed novel methods to interpolate between sparse historical soundings, infer depths of non-navigable channels from channel width, and convert historical tidal datums to modern fixed datums. 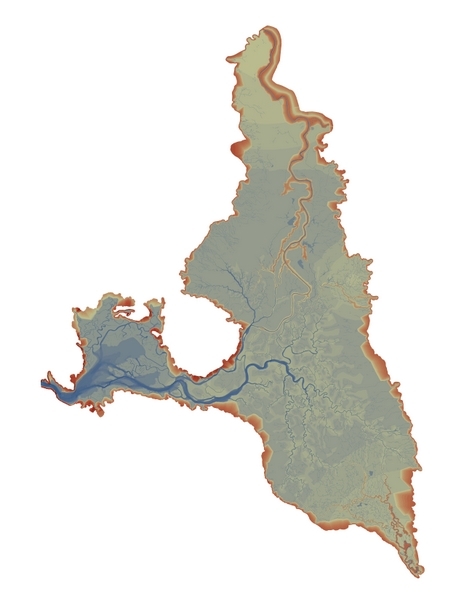 The resulting 2-meter resolution digital elevation model covers Delta historical channels, tidal wetlands, adjacent non-tidal freshwater wetlands and upland transitional areas below 25 feet in elevation.